Sinusitis is an inflammation of the sinuses. There are four paired sinus cavities in the bones of the skull that connect with the nose. There are sinuses located above the eyes, inside the cheeks on either side of the nose and in the area above the nose on either side. The sinuses serve to reduce the weight of the face and add resonance to the voice. Mucus from the sinuses normally drains into the nose; however, if for any reason, the sinuses get blocked, the mucus cannot drain, which opens the gate for infection. Sinusitis may be acute or chronic. Viral, bacterial, or fungal infections, and allergic reactions, are the most common causes of sinusitis. But it can also develop due to a nasal injury, a deviated septum, nasal polyps, or narrow sinuses. Sinusitis can also be caused by tooth or tonsil infections, or inhaling such irritants as cigarette smoke, dust, or dry air. However, the most common cause for sinusitis is allergies. Therefore, one must understand the causes of allergies and address them in order to naturally heal from chronic sinusitis. Allergies are the result of the detoxification system not working well, particularly the digestive system. Here's what Sherry Rogers, MD said about allergies in her article “Healing From the Inside Out -The Leaky Gut syndrome” published in the Townsend Letter for Doctors, February/March 1995, pgs. 26-28. 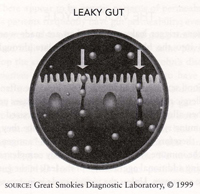 The leaky gut syndrome or LGS, is a poorly recognized, yet extremely common problem. It is rarely tested for. Basically, it represents a hyper-permeable intestinal lining. In other words, large spaces develop between the cells of the gut wall and bacteria, toxins, and foods leak out as the result. How does the gut become leaky? Through inflammation. And once the gut lining becomes damaged, the spaces open up and allow large food antigens, for example, to be absorbed into the body. 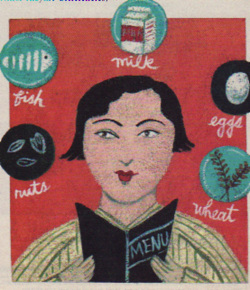 Normally the body sees only small, tiny food antigens. When it sees these new, large ones, they are foreign to the body’s defense system. So the attack results in the production of antibodies against once harmless foods. Food allergy can precipitate symptoms in literally any organ at any time, once the gut develops these large, leaky spaces. And if that were not enough, these large spaces allow the absorption of toxins that normally would not penetrate the protective barrier of the gut. These toxins then overload the liver so that chemicals cannot be detoxified. Now you have food and chemical sensitivities. Leaky gut leading to a hyper immune system, leading to allergies leading to chronic sinusitis. The natural healing program that I’m sharing with you on my website will address the main cause of chronic sinusitis, which is the leaky gut syndrome. 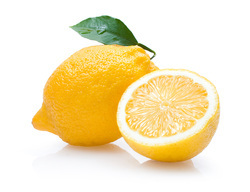 • Drink a glass of warm spring water flavored with fresh organic lemon or lime one half-hour before your breakfast. Fresh lemon juice is a traditional tonic for stimulating the appetite and increasing salivary and gastric secretions for better digestion of foods. If this is too acidic for you to try initially, then just drink a glass of warm spring water in its entirety upon waking up. Email me back and let me know how this health tip has helped you. Also do request the questionnaire from the link “Free assessment” so I can learn more about your health challenges and offer you a customized diet and an organic food supplement program to rid you of chronic sinusitis once and for all.